Rheinmetall MAN Military Vehicles GmbH (RMMV) has today announced a partnership with Adelaide based suspension and technology company Supashock for the development and manufacture of a revolutionary military suspension and integrated intelligent load handling system for its range of military trucks. RMMV has funded Supashock to develop the system for the Australian and global markets. The system integrates Supashockâ€™s novel active suspension technology with an intelligent load handling system and will substantially increase the capability and safety of RMMVâ€™s military trucks in demanding on and off-road environments. Through comparative testing Supashockâ€™s suspension technology has been shown to substantially improve the mobility of RMMVâ€™s trucks, while at the same time enhancing on-road safety and reducing the shock and vibration experienced by the load the truck is carrying. Rheinmetall sees broad application of the integrated intelligent load handling system and Supashockâ€™s suspension technology on both Australian and international programs as it will deliver a real capability edge for our customers. Rheinmetallâ€™s investment in Supashock is on the back of an Australian Federal government entrepreneurs grant that was recently announced by the Australian Minister for Defence Industry, Christopher Pyne. Rheinmetall Defence sets the global standard for excellence in a wide range of disciplines and offers an extensive array of military hardware that delivers mobility, lethality, survivability of troops and networking of national and international systems. Rheinmetall Defence Australia and New Zealand (RDANZ) is a subsidiary of Rheinmetall AG, with offices in Adelaide, Melbourne and Brisbane. Supashock is an award-winning technology company based in Adelaide, Australia. Supashock specialises in high performance engineered solutions for the automotive, racing and defence sectors with particular expertise in motion control and suspension technology. Polaris Government and Defense continues to work up plans to extend the capacity of its fleet of 'Fly and Drive' tactical ground vehicles, senior company sources have explained. Speaking to Jane's at the Special Operations Forces Industry Conference (SOFIC) in Tampa, Florida, company director Jed Leonard, explained that Polaris was considering multiple avenues in order to provide a multicapability for MRZR and DAGOR [Deployed Advanced Ground Off Road] internally transportable vehicles (ITVs). "We're always working to expand the capabilities of our family of vehicles with new platforms, variants, and mission packages," Leonard explained while highlighting the fifth anniversary of the MRZR vehicle. "We can do this because our vehicles at their core provide modular off-road mobility, and because we continue to get regular feedback from users and programme offices." Polaris is considering options to further enhance the modularity of existing platforms with options to build such capacity into a base vehicle as well as facilitation of upgrades on deployed vehicles. "We are looking for more applications for systems for both MRZR and DAGOR platforms in relation to changing concepts of operation," Leonard added, while referring to ongoing deliveries of vehicles to the US Special Operations Command. Company sources made reference to the US Army's 2017 Maneuver Fires Integrated Experiment (MFIX) exercise, conducted at Fort Sill, Oklahoma, in April, which was focused on extending the multidomain capabilities of the MRZR. "As technology advances, so too does the need for soldiers to be able to multitask without forfeiting their primary duty. With new multidomain platforms, the army hopes to give soldiers the equipment to handle the added responsibility," an army report on MFIX reads. New MRZR-based platforms called 'Hunter' and 'Killer' just completed testing during the MFIX. The MRZR was chosen because it is designed to handle various types of terrain. The army report adds "the Hunter and Killer are also designed to track aircraft, perform three-dimensional fires targeting, and provide other capabilities". MINNEAPOLIS (December 20, 2016) â€” Public Works and Procurement Canada (PSPC) has awarded its Ultra-Light Combat Vehicle (ULCV) contract to Polaris, following an open and competitive bid process. The $15.5 USD million contract includes DAGOR vehicles, maintenance and operator training, spare parts, and the option for additional vehicles (at an additional cost) to meet the requirements of Canadian Special Operations Forces Command (CANSOFCOM). Ultralight ground mobility is at the forefront of many militaryâ€™s needs â€“ especially the Canadian Special Forces, which can deploy on extremely short notice for counter-terrorism operations and other time-sensitive Special Operation Forces (SOF) missions. The DAGOR ultra-light combat vehicle is just as deployable and was designed to be modular and light-weight to support a variety of expeditionary missions. The ULCV contract is structured to provide CANSOFCOM with a custom vehicle to meet Canadaâ€™s unique SOF requirement. The flexible DAGOR platform will undergo engineering and mission configurations to incorporate new features and capabilities, including redesigned payload configuration, weapons mounts, electrical system improvements, and integrated communication systems. The final vehicle configuration, testing, and production of the ULCV will be a collaborative effort with CANSOFCOM. â€œWe are extremely pleased to have won the contract following the competitive process to provide our DAGOR vehicles to CANSOFCOM as this major international program award builds on our strong current domestic base,â€� said John Olson, PhD, vice president and general manager of Polaris Government and Defense. â€œWe are proud to partner with the Canadian government and industry to deliver this ground mobility capability and the lifecycle support to smartly sustain it. Our program management, engineering, operations, and logistics teams are looking forward to working closely with our Canadian customer. With seating for up to nine, DAGOR comprises the optimal balance of rapid air transportability, payload capacity and advanced mobility. DAGOR gives an advantage back to dismounted warfighters, allowing formations to move faster, carry more and significantly reduce combat fatigue. And its weight and size allow it to be internally transportable on a variety of in-service aircraft, including CH-47 and C-130. Polaris Government and Defense vehicles deliver a coveted combination of deployability, versatility and off-road mobility, forged from more than 60 years of off-road vehicle experience that is simply unmatched. Vehicles include the rugged Sportsman MV 850, the modular and nimble MRZR, and the DAGOR, which expands upon the range, payload and off-road mobility of any previous tactical off-road vehicle. The enhanced tactical mobility provided by Polaris Government and Defense gives an advantage back to dismounted troops, allowing formations to move faster, carry more and significantly reduce combat fatigue. Polaris FSR support is scalable worldwide and includes military vehicle training, service and maintenance. It also can be supplemented internationally through the Polaris network of distributors. And because Polaris vehicles are in service throughout the world, there is a high degree of interoperability and commonality among U.S. and allied forces. The Swiss Army is extending the operational life of its fleet of DURO (4x4) tactical vehicles through an extensive modernisation programme under a contract awarded to General Dynamics European Land Systems - MOWAG (GDELS - MOWAG). The Swiss Army took delivery of 3,000 DURO (4x4) tactical vehicles - delivered by the then Bucher Industries - between 1994 and 2002. The major upgrade programme for the Swiss Army's vehicles follows a detailed analysis undertaken by GDELS - MOWAG, which built four upgraded DURO (4x4) tactical vehicle prototypes that were put through an extensive series of trials in 2016. The company has now started series production and will modernise a total of 2,220 DURO (4x4) vehicles through to 2022, with the first production vehicles being delivered this year. A new diesel engine from Steyr Motors is being fitted plus the replacement of the existing transmission by a new ZF 8-speed automatic unit. A new braking system will be installed that includes anti-skid brakes (ASB), electronic stabilisation programme (ESP), and a traction control system (TCS). The existing two-door driver's cab will be re-used but modified in a number of areas, including the installation of new a new light emitting diode (LED) lighting system. Further modifications to the cab include the installation of a new digital driver's display and a new vehicle electric system. The existing rear cargo area will be replaced by a new transport cargo space and/or up to 12 troop seating arrangement. This will have full roll over protection and an appropriate seating system with four-point seat belts intended for higher crew survivability. The existing axles and driveline will be retained, but new wheels and rims will be provided. In addition to the main baseline troop and material carrier version of the DURO (4x4), the Swiss Army deploys the vehicle in more than 40 special variants. WASHINGTONÂ â€”Â A competition to procure a Ground Mobility Vehicle to add much-needed tactical mobility for the U.S. Army's infantry brigade combat team is delayed by several years, even as vendors with commercial off-the-shelf solutions are ready now. The reason for the delay is unclear and the Army did not directly answer the question of why its schedule to hold a competition for the GMV in 2017 had been pushed back. The Army launched its new-start GMV program in 2017 as planned, and, according to the fiscal 2017 budget request, the service intended to find a commercial off-the-shelf or non-developmental vehicle as the solution. The service said it wanted a vehicle that could carry a nine-person squad with their equipment that could be air-droppable and sling-loaded on a UH-60 Black Hawk utility helicopter. The Army planned to issue a request for proposal for the GMV in 2017 and make a contract award by the end of the fiscal year,Â according the FY17 request. Production qualification testing would take place from the second quarter of FY18 through the second quarter of FY19 and a full-rate production decision was scheduled for the third quarter of FY19. Now the Army has split its GMV procurement plans into two phases, according to the FY18 budget request released last month. In the first phase, the Army will procure GMVs for five airborneÂ infantry brigade combat teams, or AIBCT, through the U.S. Special Operations Command's GMV 1.1 contract. This means the Army is buying Flyer 72 vehicles from General Dynamics Ordnance and Tactical Systems. â€œThe Army needs to quickly fill a tactical mobility capability gap for infantry squads in five [AIBCTs]. Ensuring that our infantry squads have the capability that they need to be successful on the battlefield is our number one priority,â€� Army spokeswoman Lt. Col. Monica Womack told Defense News in a statement Tuesday. In the second phase of the program, the Army will procure 1,700 GMVs through a full-and-open competition, â€œonce the requirement is refined, which should reduce cost,â€� Womack said. Procuring the GMV 1.1 vehicles under the SOCOM contract raises the unit cost of the vehicle higher than the unit cost of a vehicle procured through competition, according to the FY18 budget documents. â€œWe are expediting delivery of a needed capability into the hands of our soldiersÂ AIBCTÂ consistent with Congress' intent that we find ways to do so,â€� Womack said. But procurement of the interim solution still doesnâ€™t get vehicles in the hands of soldiers immediately. The delivery of the vehicles will take place over the course of several years, the budget documents show. A total of 100 vehicles will be procured in FY18, 145 in FY19 and another 150 in FY20. The FY17 request shows the Army had planned to reach full-rate production in the third quarter of 2019, had a competition kicked off as planned. The Army plans to spend $194.8 million for 718 vehicles from FY18 to FY22, according to the FY18 request. According the FY18 budget document, which, unlike the FY17 version, does not have a chart showing projected milestones, the Army will fund the competition starting in the FY-19-23 program objective memorandum â€œwith an expectationâ€� that a contract award would be made in FY20. The decision to delay the competition and field an interim solution leaves many in industry scratching their heads, as the Army has spent years demonstrating and evaluating a variety of commercial off-the-shelf offerings. The Armyâ€™s ultralight combat vehicle demonstration at Fort Bragg, North Carolina, in 2014 included commercial and modified commercial vehicles: GDâ€™s Flyer; the Boeing-MSI Defense Phantom Badger; Polaris Defenseâ€™s air-transportable off-road combat vehicle DAGOR; Hendrick Dynamics' Commando Jeep; Vyper Adamasâ€™ Viper; and Lockheed Martinâ€™s High Versatility Tactical Vehicle, which is a version of the British Armyâ€™s HMT-400 Jackal. The service has continuously evaluated vehicles for GMV since then. And GD's Flyer is not the only vehicle that fits in the GMV footprint already fielded by the U.S. military. The Armyâ€™s 82nd Airborne Division has 70 Polaris DAGORs with which it is has deployed, including last yearâ€™s Anakonda exercise in Poland. It is also fielded with U.S. special operations forces. DAGOR, according to Polaris, can fit nine soldiers, is UH-60 sling-load certified and can fit in a CH-47 Chinook cargo helicopter. It is also air-drop certified. The vehicle is capable of being air-dropped and sling-loaded as well as internally transported in the CH-47 helicopter, the spokeswoman added. LISLE, Ill. --- The U.S. Army recently awarded Navistar Defense, LLC a foreign military sales contract valued at $18.8 million to provide 115 International 7000-MV Medium Tactical Vehicles (MTV) to Iraq. 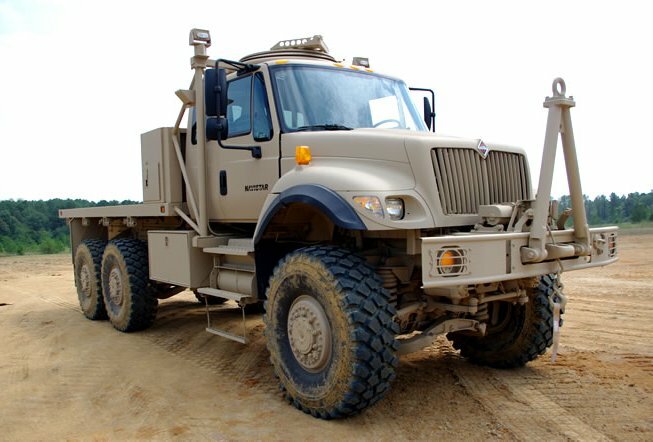 Navistar Defense MTVs are based on the highly multipurpose International WorkStar severe-duty platform designed for both off and on-road operation, and is the backbone for the company's MaxxPro Mine Resistant Ambush Protected vehicle. "Since 2004, Navistar Defense has delivered nearly 7,000 trucks and buses to Iraq through foreign military sales contracts," said Kevin Thomas, president of Navistar Defense. "As a proven partner, we're proud to supply the Iraq Army with a highly versatile and easy-to-maintain 7000-series tactical military support truck that offers greater efficiencies in support, spare parts, training, and operations." The majority of the work will take place at the company's West Point, Mississippi assembly plant. Delivery is planned to be completed in January 2018. This equipment is being used by Iraqi security forces in the Ministry of Interior and Ministry of Defense. Navistar Defense's dealer in Iraq, Hama, provides parts and service support to Navistar vehicles in Iraq and the region. Navistar International Corporation is a holding company whose subsidiaries and affiliates produce International brand commercial and military trucks, proprietary diesel engines, and IC Bus brand school and commercial buses. Rheinmetall MAN Military Vehicles has entered a framework agreement with the Bundeswehr to supply over 2,200 state-of-the-art trucks. In embarking on this major project, Rheinmetall will play a leading role in modernizing the German militaryâ€™s fleet of thousands of logistic vehicles. Awarded by the Federal Office for Bundeswehr Equipment, Information Technology and In-Service Support (BAAINBw) and structured to run seven years, the framework contract covers a total of 2,271 HX2 family vehicles with a gross value of around â‚¬900 million (â‚¬760 million without VAT). As a first step, an initial lot of 558 trucks with a gross value of roughly â‚¬240 million (â‚¬200 million without VAT) has been taken under contract, including special tools and training support. Most of the key components â€“ the engines, axles, transmissions and build-ons â€“ will be produced in Germany, though the vehicles will be assembled at the Rheinmetall MAN Military Vehicles (RMMV) plant in Vienna. Delivery of the first lot will take place during the 2018-2021 timeframe. Particularly in multinational operations, the worldwide presence of RMMV vehicles offers major advantages in terms of interoperability and logistics. Among others, the current list of user nations includes the UK, Australia, New Zealand and Denmark. Norway and Sweden have both placed substantial orders with RMMV as well. This new Bundeswehr order underscores yet again Rheinmetallâ€™s status as one of the worldâ€™s foremost suppliers of systems and equipment for ground forces, with an extensive portfolio of tracked and wheeled tactical and logistic vehicles. Under the Bundeswehrâ€™s Unprotected Transport Vehicle (UTF) programme, new vehicles from the Rheinmetall HX2 family are set to replace the old KAT I generation of trucks made by MAN, some of which have been serving faithfully for forty years. Owing to their advanced age and the associated spare parts and lifecycle costs, however, the KAT I vehicles no longer meet current standards. In operations both at home and abroad, modern armed forces depend on assured, round-the-clock mobility and reliable logistics. Robustness, versatility and functionality are the most important performance criteria â€“ no matter how bad the roads or how difficult the terrain. Increasingly important, too, are flexible add-on protection solutions, crucial for keeping crews safe during deployed operations. The latest generation of HX2 vehicles from RMMV meets all of these criteria. It is the outcome of decades of experience in developing, building and â€“ by no means least â€“ servicing military vehicles. With some 10,000 vehicles now in service around the globe, the HX2 numbers among the worldâ€™s most widely used military trucks, with abundant operational experience. The HX2 family comes in variants ranging from 4x4 to 10x10, configured for a multitude of different missions: cargo trucks and heavy-duty recovery vehicles, tankers and system platforms as well as folding-road and bridge-laying systems. The engines that power these trucks are designed for outputs of up to 680 HP. The vehicle family concept results in largely identical modes of operation, maintenance and repair as well as spare parts, leading in turn to lower lifecycle costs. Moreover, RMMV also offers full service support, all from a single source. Adhering to a strict military-off-the-shelf (MOTS) approach, RMMV uses proven, reliably modified mass production components in the HX2 family, specially designed to meet military requirements. 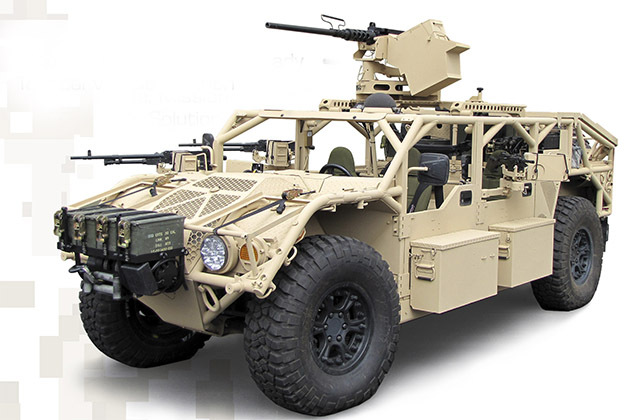 This results in made-to-measure military vehicles that deliver maximum cost-effectiveness. A crucial characteristic of these vehicles is the robust chassis design, enabling inclusion of add-on protection elements. Featuring the heaviest front axle load in its class, the vehicle can handle a heavily protected driverâ€™s cab large enough for three people. Furthermore, the cabs can also be equipped with an optional NBC ventilation system, integrated command and control systems, connections to soldier systems, remotely controlled weapon stations, jammers, active defence systems (ADS) and fast-acting smoke/obscurant dispensers. From the outset, these trucks are designed not just for maximum robustness, payload capacity, mobility and an all-terrain capability, but also to operate at temperatures ranging from -32Â°C to +49Â°C. They can also be adapted to operate in all other climates: an arctic kit is available for several vehicles that enables them to operate at temperatures as low as -46Â°C. It is also possible to fit them with C4I systems without major conversion work, while their electromagnetic compatibility exceeds that of all other trucks on the market. In the not-too-distant future, Marine Corps 7-ton trucks may be able to diagnose worn-out parts before they go bad, put in an order for a relevant replacement and get the part 3D printed and shipped to their location to be installed â€” all without a human in the loop. Itâ€™s an aspiration that illustrates the possibilities of smart logistics, said Lt. Gen. Michael Dana, the Marine Corpsâ€™ deputy commandant for Installations and Logistics (I&L). And the process has already begun to make it a reality. In the fall of 2016, Marines at Fort Leonard Wood, Missouri equipped about 20 military vehicles, including Medium Tactical Vehicle Replacements, known as MTVRs or 7-tons, and massive tractor-trailers known as Logistics Vehicle System Replacements, or LVSRs, with engine sensors designed to anticipate and identify key parts failures. Itâ€™s a commercially available technology that some civilian vehicles already use, but itâ€™s a new capability for Marine Corps trucks. Testing on those sensors will wrap-up this summer, and officials with I&L will assess how accurately and thoroughly the sensors captured and transmitted maintenance data. If all goes well, the Marines then will work to connect the sensors with an automatic system that can order parts that will then be 3D printed on demand and delivered to the vehicleâ€™s unit. Dana, who spoke with Military.com in June, is eager to bypass maintenance supply chains that sometimes have gear traveling thousands of miles to get to a unit downrange, and inefficient logistics systems that create lag while maintainers wait for parts to arrive. â€œIf we had the ability to print a part far forward, which we have that capability, that reduces your order-to-ship time. And you then combine that with what we call sense-and-respond logistics, or smart logistics, which is â€¦ it can tell you with a predictive capability that this part is going to fail in the next 20 hours or the next ten hours,â€� Dana said. 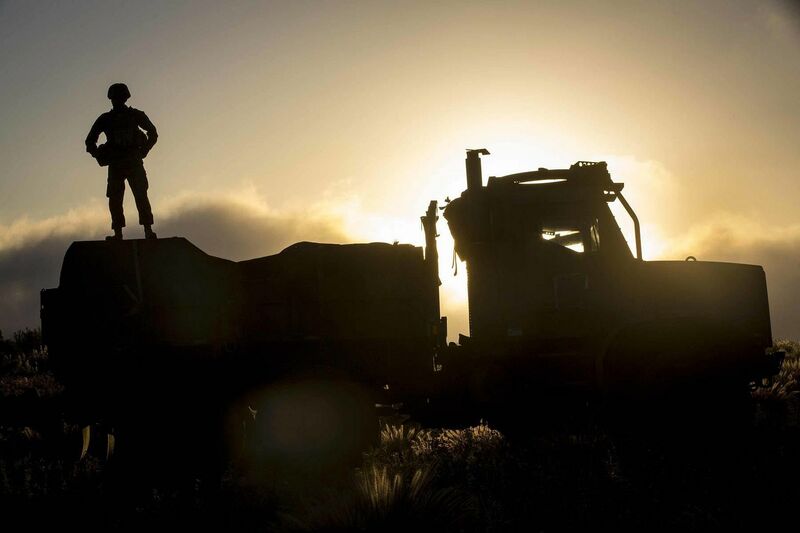 The goal of having trucks that can do everything but self-install repair parts is in keeping with the Marine Corpsâ€™ newfound love affair with innovative technology. The Corps recently became the first military service to send 3D printers to combat zones with conventional troops, so that maintainers could print everything from 81mm mortar parts to pieces of radios in hours, instead of waiting days or longer for factory-made parts to arrive. For Dana, itâ€™s simply time for the Marine Corps to cash in on technologies that industry is already using to advantage. The US Naval Special Warfare (NSW) Command is evaluating the General Dynamics Ordnance and Tactical Systems (GD-OTS) Flyer 60 as an additional option for â€˜fly and driveâ€™ operations, defence sources have told Shephard Media. The news follows the completion of a similar trials and evaluation programme conducted by the US Air Force Special Operations Command during 2016, which GD-OTS confirmed was centred on the testing of a â€˜small numberâ€™ of Flyer 60 4x4 tactical ground vehicles for multirole operations. USSOCOM is particularly interested in extending the capabilities of its tactical ground vehicle fleet, particularly in relation to emerging threat areas such as counter-unmanned aerial vehicle (C-UAV) technology, for example. However, defence sources explained to Shephard that â€˜another US Special Operations Commandâ€™ force component was currently in the process of considering Flyer 60 as part of its Internally Transportable Vehicle (ITV) inventory, designed to fit inside the cargo hold of the V-22 Osprey tiltrotor. ITVs can be carried by fixed and rotary wing transport aircraft including CH-47 Chinooks and C-130 Hercules, providing extended reach for insertion and extraction to/from target areas. Vehicles can be up-armoured if necessary for strike operations or stripped down for special reconnaissance missions, defence sources explained to Shephard. USSOCOM force elements, including US Navy SEAL Teams, are already in the process of receiving the first tranche of a total of 1,300 larger Flyer 72 variants from GD-OTS as part of the GMV1.1 programme over a seven year period. US Army Green Berets and SEAL Teams, amongst other force elements, are currently devising concepts of operation, tactics, techniques and procedures for the new vehicle type. However, the Flyer 60 comprises a smaller form factor vehicle which was designed to fill â€˜operational gaps in fixed and rotary wing ground mobility deploymentâ€™. Despite representing a smaller form factor than the Flyer 72, the Flyer 60 would provide SEAL Teams with greater range and payload capacity compared to in-service Polaris Government and Defense MRZR-2 and -4 ITVs. The Flyer 60 is available in multiple variants including armoured and unarmoured light strike; personnel recovery; and C4ISTAR configurations. 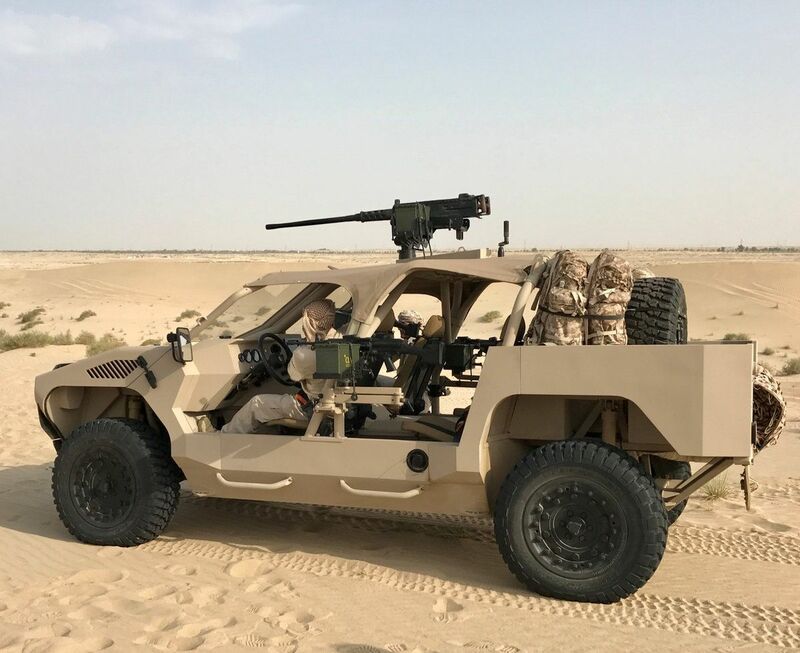 The vehicle is fitted with a 360-degree weapons mount as well as weapon positions in the commanderâ€™s seat and both sides of the rear passenger cabin. Powered by a 1.9L diesel engine, the vehicle has a top speed of 65mph and cruising range of 350m with potential to carry a payload up to 3,500lbs in weight, GD-OTS literature explains. WASHINGTON --- The State Department has made a determination approving a possible Foreign Military Sale to the United Kingdom for Joint Light Tactical Vehicles (JLTV) and accessories. The estimated cost is $1.035 billion. The Defense Security Cooperation Agency delivered the required certification notifying Congress of this possible sale today. The Government of the United Kingdom (UK) has requested a possible sale of up to two thousand seven hundred forty-seven (2,747) Joint Light Tactical Vehicles (JLTV). This possible sale also includes baseline integration kits, basic issue item kits, B-kit armor, engine arctic kits, fording kits, run-flat kits, spare tire kits, silent watch kits, power expansion kits cargo cover kits, maintainer and operator training, U.S. government technical assistance and logistics support services, and other related elements of logistics and program support. Total estimated cost is $1.035 billion. This proposed sale supports the foreign policy and national security policies of the United States by helping to improve the security of a NATO ally which has been, and continues to be, an important partner on critical foreign policy and defense issues. The proposed sale will help improve the UKâ€™s Light Tactical Vehicle Fleet and enhance its ability to meet current and future threats. The UK will have no difficulty absorbing this equipment into its armed forces. The principal contractor of this sale will be Oshkosh Defense, LLC, Oshkosh, Wisconsin. The procured items will require minimum contractor support until the foreign customer can eventually transition to internal organic support. There is no known offset agreement associated with this proposed sale. 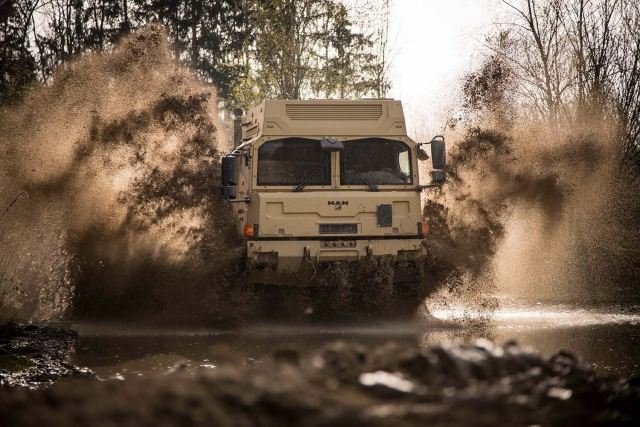 Germany's Federal Office of Bundeswehr Equipment, Information Technology and In-Service Support (BAAINBw) has awarded Rheinmetall MAN Military Vehicles (RMMV) a framework contract for 629 HX2 family logistics vehicles in the last week. The contract follows on the heels of two smaller ones awarded to Liebherr for 71 protected truck-mounted cranes. On 5 July, the BAAINBw signed a framework contract with RMMV for the delivery of 558 five- and 15-tonne HX2 trucks worth about EUR224 million (USD255 million). The seven-year contract forsees the delivery of 339 five-tonne trucks and 219 15-tonne trucks starting in March 2018. Rheinmetall will deliver an initial lot of 558 trucks in 2018-2021. Most of the key components â€“ engines, axles, transmissions, and build-ons â€“ will be produced in Germany, and the vehicles will be assembled at the RMMV plant in Vienna. All the trucks belong to the same family of vehicles, with 92% commonality among the sub-assemblies. This will reduce the operating costs because of identical spare parts and similar vehicle handling and maintenance, according to the BAAINBw. The vehicles are designed so that unprotected and protected driver's compartments can be exchanged under a guarantee from Rheinmetall. Oshkosh on 1 August announced an order for 748 Joint Light Tactical Vehicles (JLTVs) worth more than USD195 million. It marks the fifth order to date and includes â€œ2,359 installed and packaged kitsâ€�, according to the company. The JLTV contract for low-rate initial production (LRIP) of 16,901 vehicles was awarded to Oshkosh on 24 August 2015. The White Houseâ€™s fiscal year 2018 (FY 2018) budget request for JLTV is up approximately USD366 million compared with the USD775.8 million enacted in FY 2017 for the programme. In FY 2018, the request includes funding for 2,110 vehicles for the US Army, 527 for the US Marine Corps (USMC), and 140 for the US Air Force. Image Credit: Concept Sp. z o.o. The selection of the winning bid means that after more than two years of tendering, deliveries of 118 Wirus vehicle would begin, and the platform would be received by the reconnaissance units of the Polish Army. The gross value of the order has been defined as PLN 90.7 million. According to the adopted offer-assessment criteria, the vehicle proposed by the contractors, along with the complementary package, has received 100% of points (i.e. 85% for the procurement price and 15% for the guarantee-related terms). The programme assumes that high mobility 4Ã—4 vehicles are acquired, with gross vehicle weight rating not exceeding 2600 kilograms (dry weight of up to 1700 kilograms). The vehicle shall, at the same time, remain capable of carrying three soldiers, armament, specialized equipment and at least 900 kilograms of payload. A vehicle configured in this way should provide the user with autonomous operation capabilities for at least 7 days. Moreover, the vehicle shall be tailored for land (train), maritime and air transport (in the latter case: within the cargo bay of the C-130E Hercules aircraft and slung under a helicopter). It should also remain possible to drop the vehicle on a parachute. The platform should feature a roll cage and flexible floor ballistic guards, providing protection at level one, in line with STANAG 4569 Annex B norm. In the offroad conditions it is required that the vehicle remains capable of wading through at least 500 mm deep water (without preparation), go over 600 mm wide ditches and 300 mm high vertical obstacles. The engine shall have minimum power of 90 kW, and it shall be capable of being operated, for a short period of time, with longitudinal (35 degrees) and lateral (25 degrees) tilting of the vehicle. Moreover, the motor should remain of working in neutral gear, with exhaust resistance at the level of 78 kPa. The wheels should be at least 15â€�, and the tyres should feature run-flat inserts. The vehicle should be, in its standard version, fitted with a winch capable of pulling at least 65% of its gross weight. General fuel cell use may not be far away? A team of US Army scientists working with a nano-galvanic aluminium-based powder has developed a method for the rapid and spontaneous hydrolysis of water, and thus a straightforward way to obtain a source of hydrogen for fuel cells. Although producing hydrogen through aluminium is not a unique process, this approach does not require a catalyst to be added to the aluminium. "It really relates to how the microstructure has been organised within the material," Dr Chris Darling, technical team leader and co-inventor, told Jane's. "It is a unique microstructure we developed through our processing technique that allows us to get around having to use a catalyst." 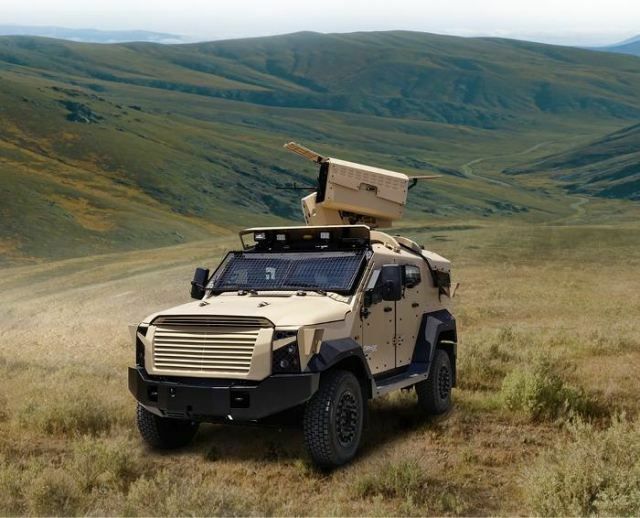 According to the website "Israel Defense", Plasan Sasa, an Israeli manufacturer of armor protection solutions for vehicles, has unveiled a new variant of their SandCat-Stormer armored vehicle, for the first time following serial delivery to an international client â€“ the Stormer RCWS/MLS. The new Stormer vehicle incorporates Rafael Advanced Defense Systems' dual Samson Mini RWS system that includes two Spike LR antitank guided missiles (ATGM) and a 12.7mm heavy machine gun (HMG) with a 150-round magazine. According to Plasan, the integration of such a heavy weapon system heralds a new era for the light armored vehicle category by fitting a light and powerful 6.7L V8 300 BHP diesel engine 4x4 armored vehicle (up to 8.8 tons) with a remotely-controlled weapon system capable of generating massive firepower up to ranges of 2000 meters. The high-precision weapon system features an on-the-move tracking capability and Spike ATGMs, two in the turret and an additional six inside the protected cargo hold, and is capable of multiple target acquisition cycles. Plasan's kitted-hull armor and proven system Integration skills enable the company to offer a cross-vehicle integration capability, including integration of automotive & mission systems, weapon stations, surveillance & communication systems, situational awareness systems and rapid vehicle-to-vehicle connectivity. More than 500 SandCat vehicles are currently in service by various units in over 15 countries worldwide. Representatives of UAE-based NIMR have confirmed to Janeâ€™s that the ability for its Rapid Intervention Vehicle (RIV) to be air transportable by a CH-47 helicopter is in response to the requirement for the platform to be interoperable and deployable as part of coalition operations, including with Gulf neighbour states operating large fleets of Chinook helicopters, such as Saudi Arabia. The RIV was designed to be a rapidly deployable 4x4 capable of underslung or internal transport by CH-47. To support this, the vehicle is now known to be fitted with adjustable hydraulic struts to raise and lower the vehicleâ€™s chassis. The lineage of the RIV can be traced back to 2013 and an effort by UK-based MIRA to develop a light strike platform from a clean sheet design. In its present guise the RIV programme was undertaken initially as a private venture following an identified market gap in 2015, but with a subsequent development contract from the United Arab Emirates. The RIV is also being marketed for potential eastern European customers and Janeâ€™s understands that NIMR is currently negotiating a contract with an undisclosed European country for one of its vehicle designs. NIMR is also understood to have developed winterisation kits for the vehicleâ€™s drivetrain in order to adapt to cold and wet conditions. Additionally, the vehicleâ€™s protection levels have been tested in conjunction with NIMRâ€™s Czech partner VOP, so as to demonstrate NATO STANAG 4569 conformity. 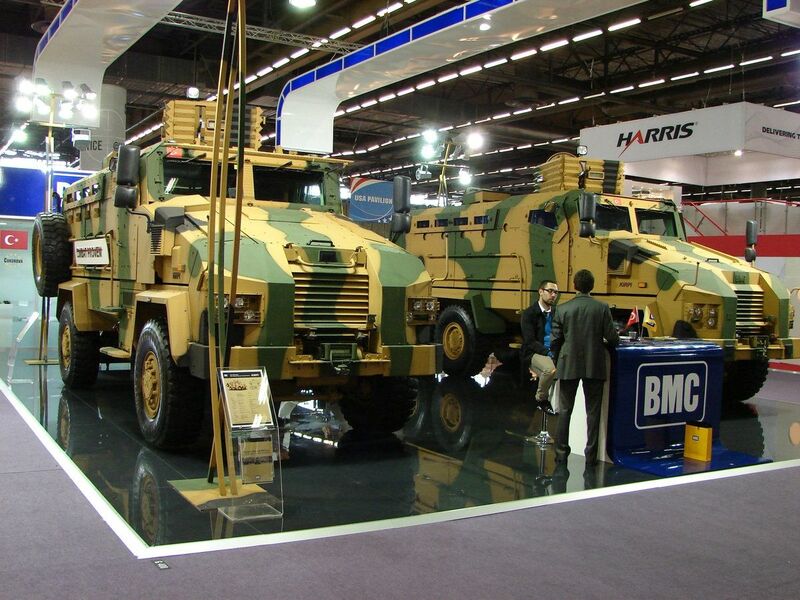 ANKARA â€”Â BMC, a leading Turkish armored vehicles maker, signed Aug. 8 a contract with the Turkish government to produce and sell a total of 529 tactical wheeled armored vehicles, the government said. Turkeyâ€™s defense procurement agency, the Undersecretariat for Defense Industries (SSM), said that BMC would act as the prime contract in the program for the procurement of 529 armored vehicles, meaning the company would be expected to work with other local companies designated as sub-contractors. The statement means the planned vehicles would be deployed mostly in Turkeyâ€™s southeastern provinces where the Turkish military fights Kurdish insurgents. The fighting, which began in 1984 and has since taken up more than 40,000 lives, resumed after the Kurdish fighters, designated as terrorists by Turkey, the U.S. and the European Union, ended their unilateral ceasefire in July 2015. A procurement source familiar with the contract said that the deal was worth â€œover 300 million euros,â€� or about $350 million. 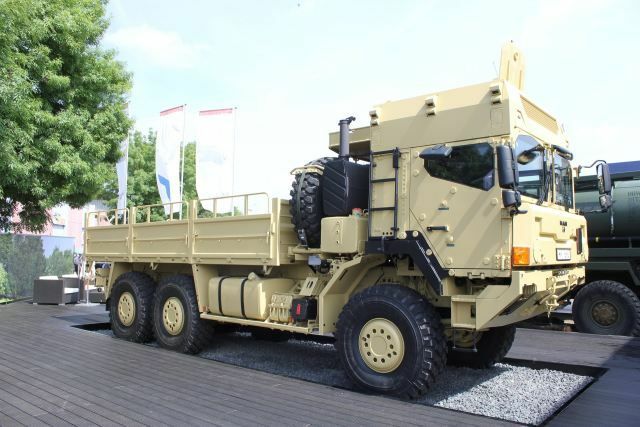 SSM said that the contract also involves procurement from BMC of an unspecified number of the Yeni Kirpi, an advanced version of the Kirpi, BMCâ€™s mine-resistant, ambush-protected vehicle which was showcased in May 2017 at the IDEF defense and aerospace exhibition in Istanbul. BMC is partly owned by businessman Ethem Sancak, a close friend of Turkish President Recep Tayyip Erdogan. Sancak also sits in the central executive commit of Erdoganâ€™s ruling Justice and Development Party. A Qatari investment fund holds a 50 percent stake in the company. Last year BMC launched RBSS, a Turkey-based joint venture, with Germanyâ€™s Rheinmetall and Malaysiaâ€™s Etika group. ABU DHABI â€“ NIMR Automotive revealed how its new 4x4 all-terrain vehicle performs on the burning desert sands of Abu Dhabi, with the sun beating down as it swept over curves and the dust danced in its tracks. Indeed, as the company designed and manufactured its vehicle in temperatures that reached near 150 degrees Fahrenheit, NIMR looked beyond the borders of countries within the Gulf Cooperation Council to those with colder climates to widen its market. The vehicle is fully customizable for countries in Eastern Europe, in particular, that are faced with insurgency and in need of armored vehicles for border security. NIMR and partner MIRA, an engineering company based in the UK worked closely with the reconnaissance and special operations teams of the UAE Armed Forces to develop the vehicle specifications â€œfocused on the military capability thatâ€™s required,â€� said Maj. Gen. Carey Wilks, NIMRâ€™s chief operating officer. â€œWe needed something that would go inside a chinook and to be able to deploy from a chinook without preparation, to deploy straight into action,â€� Wilks said. The RIV is designed to travel by land or helicopter, either within a CH-47 or strapped below, carrying a 12.7 millimeter caliber heavy machine gun. The vehicle is equipped with an add-on ballistic armor kit, a self-recovery winch, C4I command and control and tactical communications. The vehicle is manufactured and tested at its facility in Ajban, Abu Dhabi. NIMRâ€™s new test track at the location allows for test driving of the vehicle on a wide range of terrain, including a 60 degree slope, shallow water, and rocky ground. â€œThe challenge was not the individual technology,â€� said Mark Carter, MIRAâ€™s senior manager of electrical and control engineering. â€œThe challenge was balancing the power, the top speed, the power-to-weight ratio, the train accessibility, the air transportability. But also, [ensuring] it can operate comfortably in environments that we see today,â€� he explained. â€œItâ€™s hugely challenging at 150 degrees. People shouldnâ€™t underestimate the amount of work we have to put into controlling the temperature cooling system,â€� Carter added. NIMR also includes a winterizationÂ kit in the RIV with engine and cabin heating to ensure the necessary fuel systems are heated for temperatures that reach near -25.6 degrees Fahrenheit. Speed and mobility remain â€œkey design characteristics of a special operations vehicle like the RIV,â€� said Miles Chambers, senior international business development executive. But what company executives recognized with engagements in Eastern Europe is that conditions are as important. â€œDesigning vehicles for the hot climate is suitable for the local and regional market, but the same engineering effort is going into the control of these vehicles for a wider market for cold climates,â€� Chamber noted, pointing to the need forÂ winterization and winter testing and winter kits to ensure the automotive components of the vehicle, for example, can perform in cold climates. As Eastern Europe struggles with the growing threat of insurgency amid growing investment by Russia in its military, the region faces international pressure for increased investment in defense capabilities. â€œWeâ€™ve seen [this] in the Czech Republic as they start to phase out the Land Rover Defenders. They now have a requirement to replace these with more militarized-capable vehicles,â€� Chambers said. Across the region, â€œthereâ€™s a broad spectrum of equipment theyâ€™re going to now need to look into replacing, [shifting] away from commercial platforms to true militarized platforms where the vehicle life now extends from the 3-year of the commercial vehicle to up to 15 years of the military platform,â€� Chambers said. 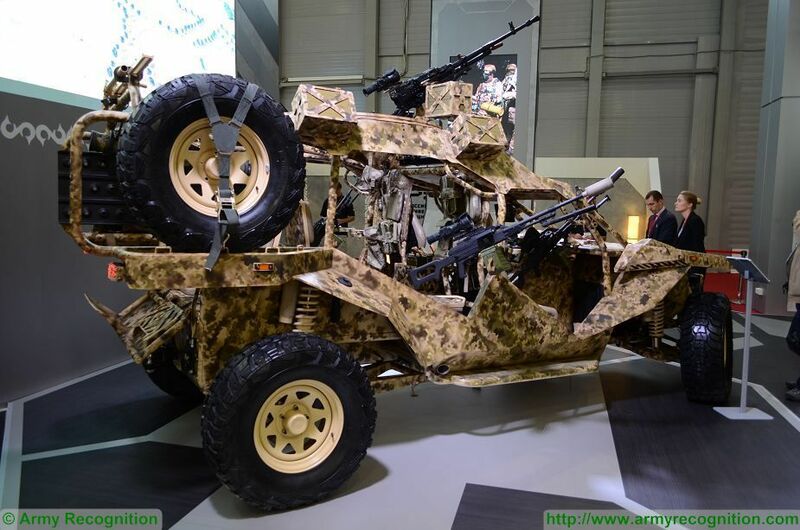 Chechen Republic presents Chaborz M-3 and M-6 combat buggy at Army-2017. Chechnyaâ€™s special purpose force training center has presented Chaborz M-6, a new, locally manufactured, six-seat buggy at Army-2017. The M-6 is armed with 7.62mm Â«PechenegÂ» machine gun mounted on each side of the vehicle and ne 12,7 mm Â«KordÂ» heavy machine gun mounted on the roof which has a traverse of 360Â°. 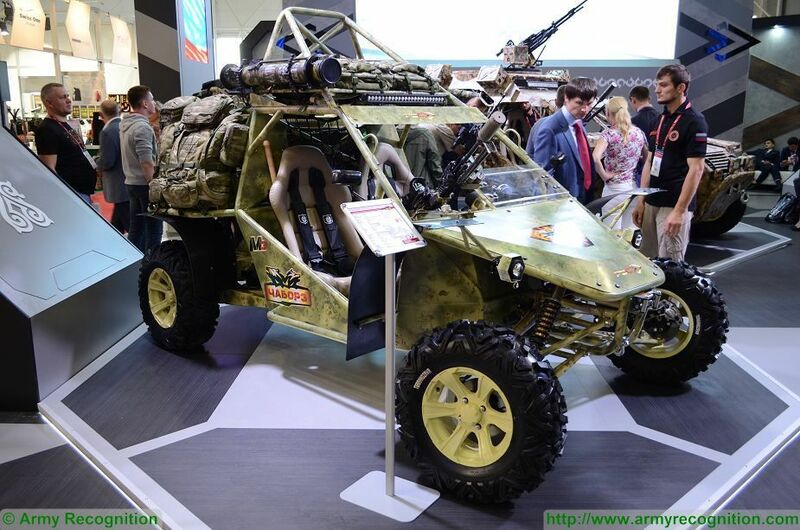 Chaborz M-6 combat buggy made by the Chechen Republic at Army-2017, the International Military Technical Forum near Moscow, Russia. "The display stand of the Chechen Republic has presented a new large six-seat buggy, Chaborz M-6. It is designed primarily for military purposes, offering a range of capabilities for carrying loads and mounting extra equipment. The series production of these off-road vehicles at the Chechenavto plant will start following a presentation at the Army-2017 forum," the press service said. The Chechen Republic also presents a three seat version of its local-made buggy under the name of Charboz-M3. Developed by Russian engineers to be used as an assault, reconnaissance, medevac, or command vehicle, the light, multipurpose all-terrain vehicle can transport a crew of three and up to 250 kg of payload. The vehicle has been designed to be used in desert, mountain, and steppe terrains. The Chaborz M-3 and M-6 can be armed with with 12.7mm Kord and Pecheneg machine guns, as well as automatic grenade launcher. Chechenavto plant started to produce the Chaborz M-3 three-seat buggy for the military in March 2017. As of today, the series production amounts to 30 vehicles per month. 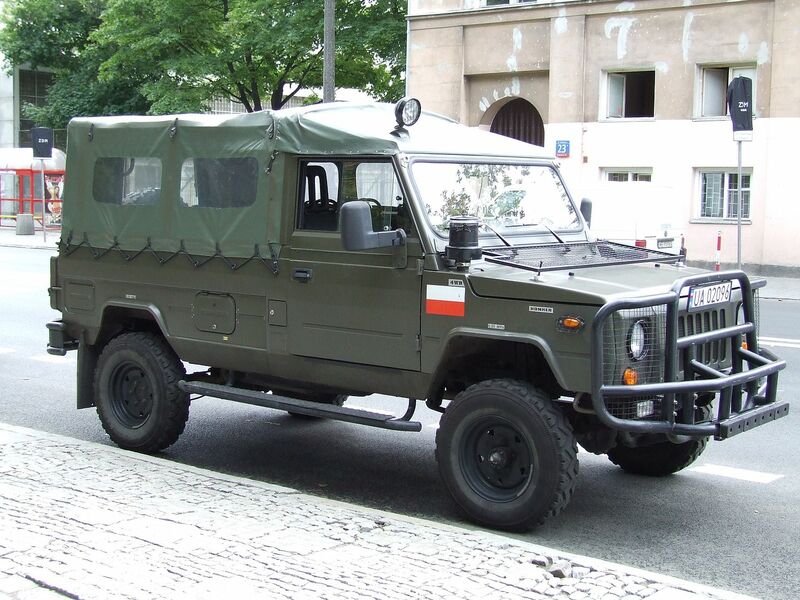 The Polish Armament Inspectorate has relaunched a competition for a new light multipurpose 4x4 vehicle, after the initial tender fell through last month. The programme includes options for an additional 2,787 unarmored platforms with deliveries to conclude in 2026. These new vehicles will replace legacy Honker (pictured above) and UAZ469 jeeps. Poland's requirements call for an all-wheel drive capable platform with a maximum gross vehicle weight of 3,500 kg (soft skin) and carrying capacity of at least 1000 kg (600 kg for the protected variant). The new platforms will accommodate nine people - a driver plus eight passengers - in the unarmored version and five people in the protected variant. All vehicles should have a wading capability of at least 500mm (without preparation) or no less than 650mm (with preparation). Furthermore, the armored platform will be equipped with run-flat tyres and have a STANAG 4569 protection level 1 for both kinetic energy and blast resistance. In May 2017, the Armament Inspectorate took industry by surprise and announced that only one bidder, a consortium of Polska Grupa Zbrojeniowa (PGZ) and Wojskowe Zaklady Motoryzacyjne (WZM), decided to submit its offer, which led to the cancellation of the programme a month later. In a written reply, the Armament Inspectorate admitted that the tender was cancelled due to the consortium's offer significantly exceeding the planned budget. The Polish Army is willing to allocate approximately 230 million Polish Zloty ($63 million) for the Mustang program. On 29 August, the US Army Contracting Command awarded global vehicle solutions provider AM General a 5-year, firm fixed price Foreign Military Sale (FMS) requirements contract to manufacture an estimated quantity of 11,560 new High Mobility Multipurpose Wheeled Vehicles (HMMWV), for approx. $2.2 billion. Under this contract, AM General will provide a wide range of variants including protected weapons carriers, cargo transporters, communications vehicles and ambulances. The vehicles under this contract builds upon the current globally installed base of over 250,000 HMMWVs in use worldwide in over 60 different countries. AM General continues to design, test and build these improvements into the HMMWV Ambulance and Army National Guard HMMWV Modernization Public Private Partnership Programs, and even more enhancements are available to meet US domestic and international customer needs. High-performance brake and clutch system specialist, Alcon Components, has developed an upgrade package for the Ford F550, as the company continues its push into the defence sector. 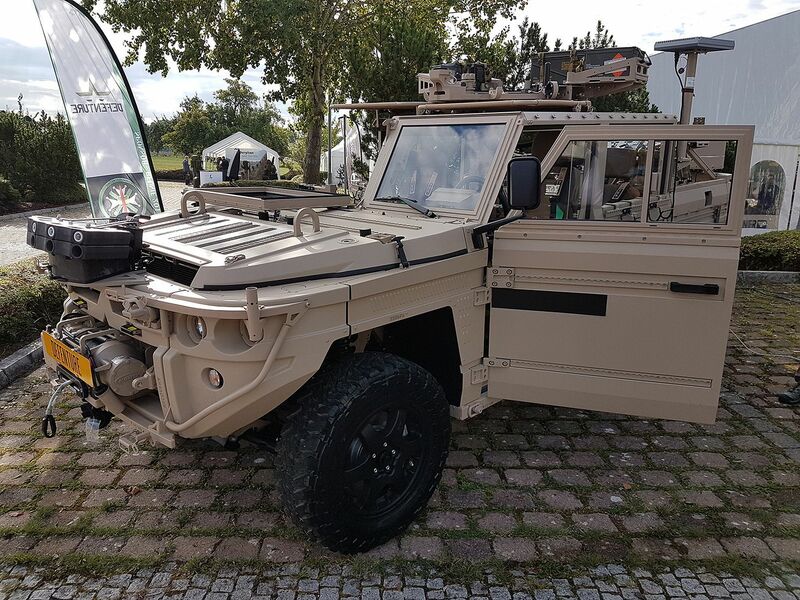 At this years KSK Symposium, Defenture presented its GRF 5.12 Air Transportable Tactical Vehicle (ATTV), which the Dutch MoD calls the Defenture VECTOR. The ATTVÂ is a new super-light tactical vehicle for use in military and Special Forces operations.Â This lightweight tactical vehicle is based on a centre tubular chassis platform, which allows for quick reconfiguration of the vehicle to meet various mission needs. It offers rugged reliability and superior agility and canÂ be air transportable internally by medium helicopters such as CH-53 Sea STALLION and CH-47 CHINOOK. The global defence industryâ€™s most versatile Light Weight Recovery (LWR) vehicle will be unveiled by UK high mobility vehicle specialist, Supacat, at DSEi in London. The 10.5 tonne HMT Light Weight Recovery (HMT LWR) has been developed by Supacat to fill a capability gap to recover vehicles operating in hard to access urban and rural locations as required by the UK MoDâ€™s Light Weight (Air Portable) Recovery Capability (LW(AP)RC) programme. 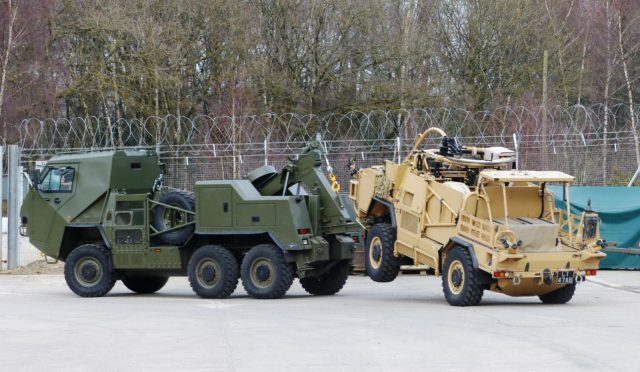 The 6Ã—6 HMT LWR offers high levels of agility, off-road performance and protection in common with Supacatâ€™s High Mobility Transporter (HMT) family, which includes `Jackal` and `Coyote` now within UK MoDâ€™s Core Fleet. 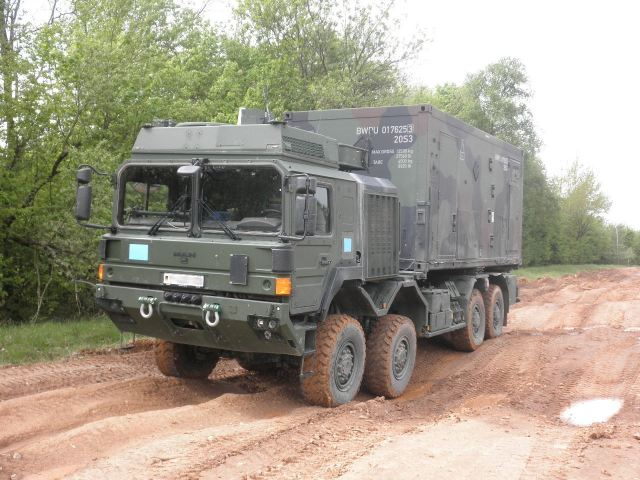 HMT LWR utilises many HMT design features such as the variable height air suspension system, engine and drive line that have been battle proven in numerous theatres. Blast and ballistic protection has been built into the chassis providing the optimum protection for its weight of 10.5 tonnes. HMT LWR utilises an innovative new Supacat designed technology, `Supalift` (patent pending), which extends the range of vehicles that can be recovered by a light weight recovery vehicle. HMT LWRâ€™s recovery system can be operated both in conventional mode and by the operator engaging `Supalift`, which increases the maximum lifting weight of the recovery system by up to 50%. In conventional mode the HMT LWR recovery system lifts a maximum recovered vehicle axle mass of 3.8 tonnes and in `Supalift` mode rises to 6.1 tonnes (specification based on recovering an HMT 400 `Jackal 2`). `Supalift` technology is based on the principle of distributing the weight of the casualty vehicle more evenly over the recovery vehicle. Phil Applegarth, Head of Supacat, said, â€œHMT LWR provides customers with a highly versatile and cost effective light weight recovery capability, with the flexibility to recover a wide range of vehicles. We are very proud of our engineering team in developing `Supalift`, which finally makes a light weight recovery vehicle a reality and is a game-changer in extending the lifting capability of recovery systems for defence and other industry sectorsâ€�. HMT LWR is fitted with a specially designed Boniface and Miller Century 2465 hamper and a Rotzler TR80 main winch. These will be fitted as standard but as with all HMT platforms the modular hamper design can be reconfigured to suit any role. 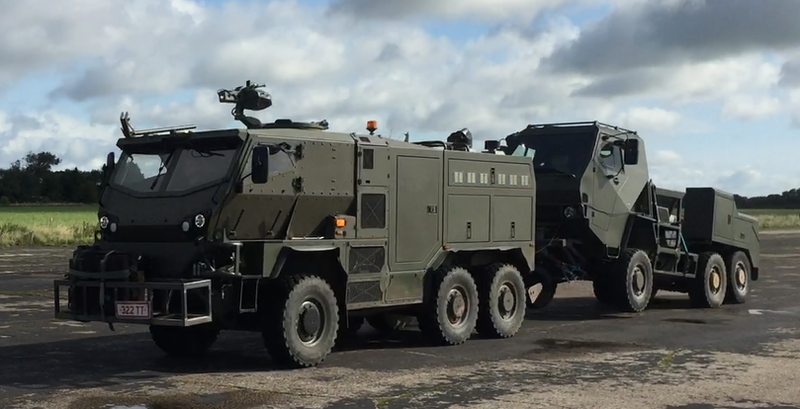 At last yearâ€™s DVD show Supacat revealed the concept demonstrator for the LW(AP)RC programme as one of several new variants of the HMT platform. This has since been developed as HMT LWR to full prototype, which will be displayed on Supacatâ€™s DSEi stand N9-360. â€œHMT LWR also demonstrates the flexibility of the HMT platform in being configurable to different roles to meet the needs of current and future programmesâ€�, said Phil Applegarth, Head of Supacat.